You are here: Home / Food / Cooking with Kids / Birthday Cake Panic, Baking with my little Cake Boss…. 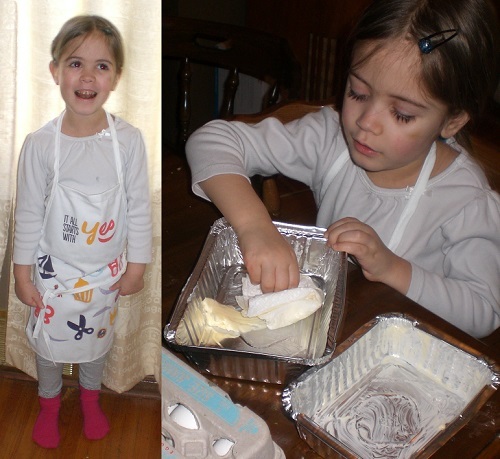 Birthday Cake Panic, Baking with my little Cake Boss…. I have never made a birthday cake. Ok, technically that’s not 100% true. My mom loves to tell the story about how I made her a birthday cake by mixing flour and other various substances in a pile on the kitchen floor when I was about G-Girl’s age. But since becoming a mom myself I’ve managed to get through five birthdays with the big kid, and two with the little one, all with cakes made by family members or picked up at the store (thank you Bubby and Aunt Holly!). 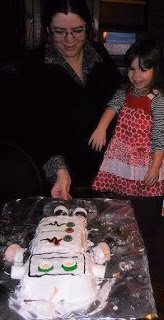 However this time… well G-Girl wanted to bake her sister a birthday cake. She was really obsessively focused on it. She started talking about it months ahead of time, and didn’t forget about it, or change her mind. As time went by the proposed cake grew more elaborate, until eventually she decided on a Robot Cake. Oh and not just any Robot Cake, but a “Robot Rok” cake, to match with Baby-G’s favourite stuffed doll. Part of the problem here is my five year old baker to be has been watching episodes of Cake Boss… so yeah, let’s just say she went into this with high expectations. And while I love to cook, a baker I am not. The idea of making a cake from scratch, well frankly it didn’t even really occur to me. 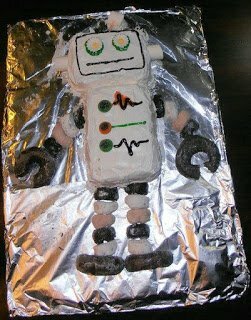 I had seen a photo online of a cute robot cake which used mini donuts for the arms and legs, which I thought was both simple and brilliant. So I picked up some boxed cake mix,and canned icing, as well as mini donuts, and full sized donuts. While my sister, the one who often makes cakes for occasions like this, sent over some gel icing, sprinkles and other doodads for decorating with. One very excited baker in training. The first obstacle we ran into was when I realized I don’t actually own a cake pan. Could I just bake it in my glass lasagna pan? Would that turn out? My sister suggested these disposable tinfoil pans, and it seemed like a good idea at the time. 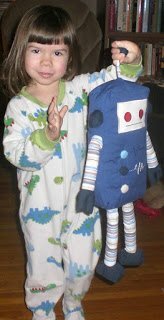 The sizes were perfect for what I wanted to make, one large rectangle for the robot body and a smaller rectangle for the head. I had bought two boxes of cake mix, just in case. I made one box, but as I poured it into the pans there didn’t seem to be enough to go around. So I made a second box. Then I had extra batter left over, so I filled a third cake pan with the excess. And this is where I royally messed up, I filled the disposable pans a little more then 3/4s of the way full. I knew the cake would rise, but I didn’t anticipate how much. Apparently I should have filled them to the half way point (oh hey, and then one box of mix probably would have been enough!). I also wasn’t sure how long to bake it for. The box had times and temps listed for various sizes of baking pans… but I was using a completely different size. I took a guess based on what they had listed on the box and went with 24 minutes at 325F. I set a timer and G-Girl and I went down into the basement to tidy up and decorate for our “party”. The timer rang, I jogged back up to the kitchen, immediately noticed a horrible burning smell, and started to freak out. When I opened the oven door… It was like two little raw dough cake fountains. The tops of the cake looked brown, done and cake-ish… but there was raw liquid dough spurting up over the sides and flowing into the bottom of the oven. Like little cake volcanoes going off. The horrible smell was from the dough burning on the heating element, and all over the oven bottom. 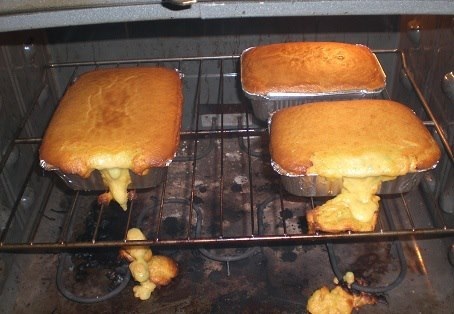 The cakes themselves weren’t burnt, they were raw, basically liquid. I didn’t need to stick a toothpick in one to know they sure as heck weren’t done. I set the timer and cooked them for 4 more minutes… still raw and runny, still overflowing. Pretty sure it’s not supposed to look like this…. The end result wasn’t that bad, but getting there was a bit nerve wracking. I had posted a picture of my cake wreck in progress on my Facebook page and some helpful peeps made suggestions on how to trim the cake. And they were dead on, a sharp knife to trim off the edges, and this cake was good to go. I had originally intended to dye the icing blue to match Robot Rok, but we were running late as it was. I had made a “cake board” out of cardboard and tinfoil. We plunked the cake down on there, iced it, added decorations, and created the donut arms and legs and the end result was pretty cool. What about you guys? Any good cake making stories? Ever gotten in over your head in the kitchen? (even better, with your kids looking on, right)?